What are the operating requirements of the digital display blast dryer? The blast dryer is a kind of drying equipment. It is mainly used for baking, drying, sterilization and heat treatment. It is very suitable for routine testing in industrial and mining enterprises, basic laboratories and workshops. However, it is not recommended to use it uninterruptedly for a long time. For some samples with high temperature uniformity and high water content, it is not recommended to use this equipment. Valuable items can be put forward to the manufacturer to control temperature by pretending to have independent temperature limiting control function, which is one of the necessary equipment for laboratory equipment. 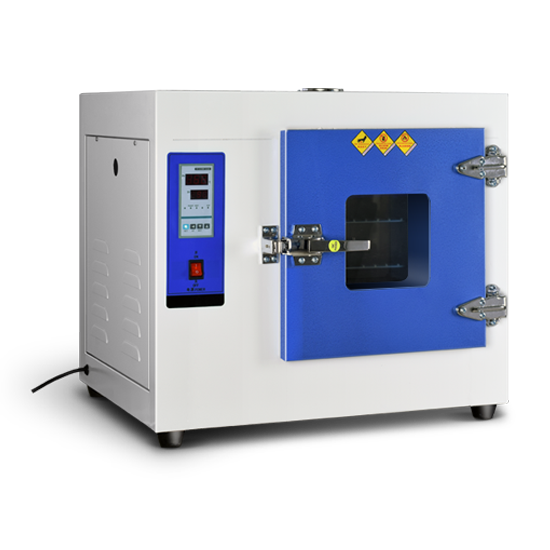 The air in the working room of the digital display air blast dryer is heated by an electric heater, forced circulation by a fan, and uniform heat exchange is carried out between the air and the heated articles in the working area to achieve the purpose of baking or drying. 2. Connect the power supply equipment which is consistent with the requirement of the blast drying box, and grounding the grounding end of the power supply socket used reliably. 3. Turn on the power switch, the power indicator lights on and the temperature control instrument starts to show the temperature of the studio. 4. There are two heating switches. If heating needs to be turned on at a lower temperature, heating 2 should be turned on at a higher temperature and heated at the same time. 5. According to the needs of the heated articles, turn the temperature setting knob (or press the dial switch) on the temperature controller to set the temperature, and the drying box starts to heat up. 6. After the work is finished, the heating switch 1, the heating switch 2 and the main power switch can be turned off.